We get many questions about finding a single GPS that does it all, taking you from car to trail to the lake or offshore. Oh, and geocaching would be nice, too. And, of course, it needs to be waterproof and have great battery life…oh and how about a removable battery to boot? Well, Garmin’s been busy on your behalf and the nüvi 500 series may be the ideal solution in the emerging “crossover” class of GPS systems. Like its nuvi relatives, the 500 and 550 models are sleek and easily fit into your pocket or pack as well as your hand for comfortable handheld operation with an impressive battery life of 8 hours. Both the 500 and 550 include preloaded U.S. topographic maps and accept many additional maps for your outdoor activities. For example, you can simply plug in BlueChart® g2 Vision and Inland Lakes Vision marine maps on a microSD™ card if your plans take you out on the water. 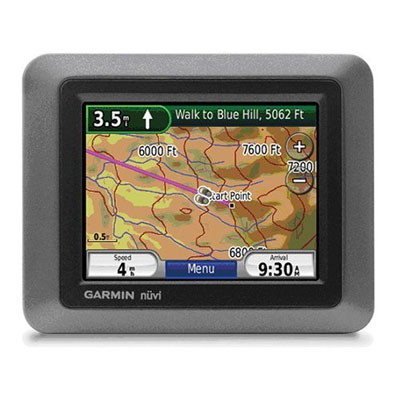 The 500 series includes Garmin’s latest next-generation GPS chip set which is highly sensitive locates your position quickly and precisely and maintains your position even when traveling under heavy cover, canyon walls, and tall buildings. and near tall building and trees.own it. In addition, the nuvi 500 series includes Garmin’s “HotFix™” feature — known to Geeks as “Satellite Ephemeris Data Prediction.” With HotFix, your GPS remembers (for up to 3 days) the orbital position of all satellites it is tracking when you turn it off, predicting where they should be when you next power it up, dramatically reducing the time it takes your GPS to fix your position and start navigating. they should be the next time you turn it on. This gives the device an idea of where it should look for satellites, and dramatically decreases the time it takes for your Garmin to get its position and start navigating. No more long waits until the GPS is ready. Of course, the nuvi 500 series is waterproof to IPX3 standards, surviving immersion for up to 30 minutes. It’s the first waterproof unit in the nuvi family. The microSD card slot is safely tucked away inside the battery compartment, keeping it free of moisture and dirt. We are also happy to see that Garmin has built the 500 series with a user-replaceable battery, letting you swap in a spare should you run out of power in the backcountry. The nuvi 500 series includes Garmin’s “Where Am I?” safety feature which helps you find the closest hospitals, police stations, fuel stations, nearest address and intersection. It also lets you see your exact latitude and longitude coordinates. Like the Garmin Colorado, the nuvi 500 series takes the popular sport of geocaching seriously with many integrated geocaching features, including “paperless” geocaching. No need to scribble latitude/longitude coordinates of caches on scraps of paper. With the 500 series, you can simply download them from geocaching.com or any other source using the GPX standard. The nuvi 500 series is also equipped with features for playing the new Wherigo location based-adventures and games. So what do you give up with the Garmin nuvi 500/550 crossover? We were disappointed to see that text-to-speech technology, which reads street names aloud, is unavailable on either model. Neither offers Bluetooth or an MP3/audibook player. However, we were pleasantly surprised to see that both are compatible with FM-TMC traffic and MSN Direct services, giving you a choice of services for real-time traffic monitoring. MSN Direct provides traffic and weather updates, fuel prices, movie listings, local events info, and more. If saving money on gas is important to you, the MSN service provides both the ability to avoid traffic and find the least expensive fuel. Both traffic services require the additonal purchase of a traffic receiver and a subscription. With the nuvi 500 series, you have the ability to send addresses to your GPS directly from Google Maps or Mapquest. Simply find a restaurant or other location you want to visit on Google Maps or Mapquest and specify “send to GPS” and the location will automatically transfer to your GPS when connected to your computer. Looking for a vehicle GPS that can show a view of the complete route from start to finish before movement of the vehicle. I am planning a 2 week trip on motercycles and want to purchase a GPS for the trip. Never had one and don’t know much about them. Is the Nuvi500 a good choice? Does the Nuvi 500 have the capability of being used in Europe, ie: a chip for France, Germany, etc.??? If so, what is the loading prceedure, where do i purchase, and what is the price??? ?